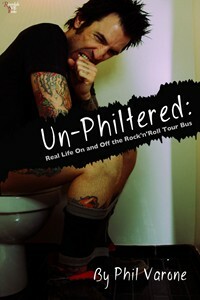 ‘Unphiltered: Real Life On And Off The Rock’n Roll Tour Bus’ by Phil Varone will be published on April 17th through Riverdale Ave Books. Phil Varone is a rock drummer, director, producer and comedian, best known for his stint with the rock groups Saigon Kick and Skid Row. Varone shares his thoughts on what it’s really like to be a rock star on a bus for weeks on end, the man-band bonding rituals, and the endless groupies. He tells the inside story of what it was like to sleep with more than 3,000 women — and remember only half of them. In one of the most riveting chapters of the book, “I Said/She Said — A Look into the Groupie Mind,” the reader meets many of the women he bedded. It features often explicit stories from numerous women in his life, juxtaposed with Varone’s memories (or lack thereof) of their encounters. ‘Unphiltered’ takes the reader through Varone’s childhood on Long Island, his role in founding Saigon Kick, and his bizarre journey through the ’80s and ’90s rock scene. Throughout the rock’n roll memoir, Varone tells readers how he sees the world in a no-holds barred riff on American culture — from what makes it so unique and great to what makes it funny and often sad. Readers of ‘Unphiltered’ will find out what Varone thinks about Donald Trump, Mitt Romney and reality TV, and will finally learn what happens when the bathroom doesn’t work on the tour bus. The e-book and trade paperback from Riverdale Ave Books will be available through www.riverdaleavebooks.com, Amazon.com and other online venues.